EIGHTH STREET – Even as the Creamery District redfines and develops its identity, one of its constituents has morphed into a business creativity foundry all its own. 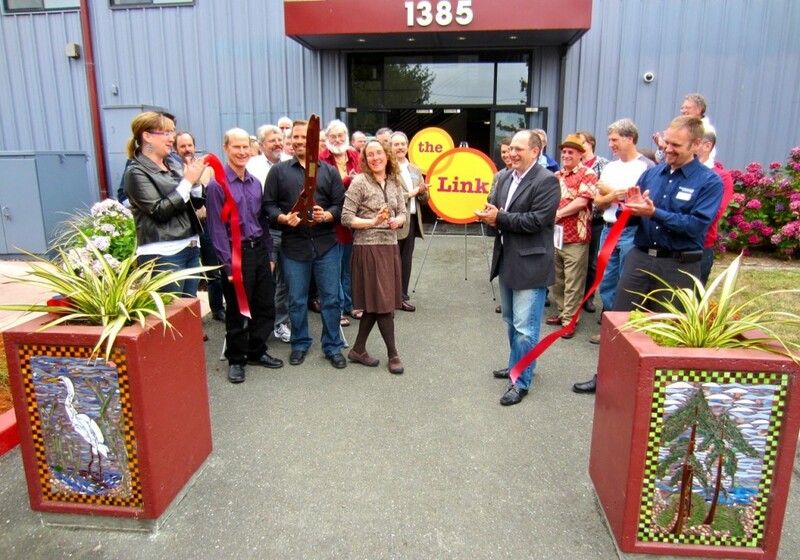 Friday, Sept. 7, Greenway Partners cut the ribbon on the Link, a collaborative business incubation center located in what many still know as the Yakima Building, now rechristened the Greenway Building. With Yakima-era Duane Flatmo murals still glorifying the walls, the new center aims to attract businesses, nonprofits, and other organizational members open to connecting and collaborating on new projects. More than two dozen businesses are already located at the Greenway Building, including the Humboldt County Film Commission, Northcoast Environmental Center and the Community Alliance With Family Farmers. The building’s second floor has been remodeled to optimize interactions between tenants. An open central area is ringed with offices awaiting new users. Amenities at the Link include high-speed Wi-Fi, accerss to printing and copying, meeting rooms and a vegetable garden out front. Link members will have access to workshops, networking events, mentors, access to mentors and advisors and other offerings. The Link also provides space for social mixers, private events and conferences. Any given business may or may not mesh with the philosophical premises of the Link. Core principles are collaboration, community, sustainability and social responsibility. There are several levels of membership, from a discounted student rate to middle levels with desk space in an open area to private offices. Events open to the public will explore ways to inspire new ideas, develop local assets and increase community engagement in creating economic opportunity. Four years in the making, the project was accomplished with assistance from Redwood Capital Bank and built by Pacific Builders. Information about the project is available at the-link.us or by calling Greenway at (707) 822-0597. This entry was posted on Wednesday, September 19th, 2012 at 8:59 am	and is filed under News, Community, Business, Media. You can follow any responses to this entry through the RSS 2.0 feed.